Over the last few years, turnips are turning up in more and more gardens and on more and more tables because of a shift in dietary habits. They're grown for both their healthy greens and their root veggie, performing double duty on the dinner table. They are high in calcium, phosphorus, potassium, sodium and magnesium and also provide vitamin C, folate, and niacin. A high fiber content and an inexpensive price tag make them a great option to add variety to a diet. Turnips are quite easy to grow, and go from seed to harvestable root veggie quickly. By following these planting tips you can begin harvesting within 45 to 50 days after planting. Unlike most garden vegetables, turnips are a cool season crop and do not do well through the heat in the middle of the summer. They should be planted early in the spring (2-3 weeks before the last frost even) for a late spring/early summer harvest or late summer for a fall harvest. According to Gardening Know How, turnips planted early in the season will be more tender, and autumn produce will be hardier and store well through the winter under the proper conditions. Turnips will take as much sun as they can get. Plant them in full sun spots of your garden that receive at least 6 hours of direct, unfiltered sunlight daily. They will tolerate slight shade but prefer the sunnier spots. Root crops need a soil bed that has been worked well, further down than other typical vegetables. This gives them a good, friable soil base that allows the roots to easily move through the soil. If roots encounter any obstructions it can cause deformation. Till the garden soil 8-10" deep to allow the turnips to grow unobstructed. When working the garden bed prior to planting, work in 2-3" of aged compost or decomposed manure to increase the organic matter content or the soil and improve the soil structure. Turnips do best when they are direct seeded into the garden soil instead of starting them indoors and transplanting outside, or buying plants from the local garden center or nursery. Grow What You Love explains that many root crops don't like containers because if their taproot touches the container at all it will deform the root, causing it to fork or grow in a funny shape. The seeds are small, and will germinate quickly. Make sure to plant them no more than 1/2" deep so the sprout can easily reach the surface. One of the best ways to plant turnips is to scatter seeds on the garden bed and then lightly cover them with up to a half inch of soil. Plants will grow quickly and germinate within a couple of days of planting. If you are growing them solely for turnip greens, thin seedlings to a spacing of 2-3" when they are about 4" tall. 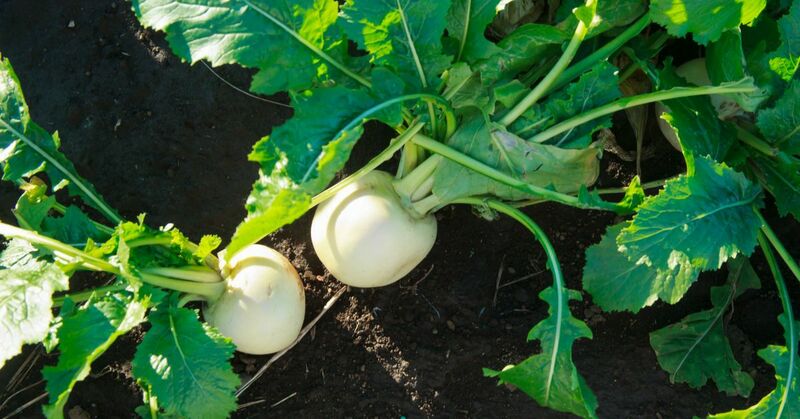 If you are growing for the turnip itself plants should be spaced 4-6" apart to allow room for good root development.